I finally got around to installing the AeroCool Coolpanel III in the gaming machine. I purchased this back when I got the battle chair machine. 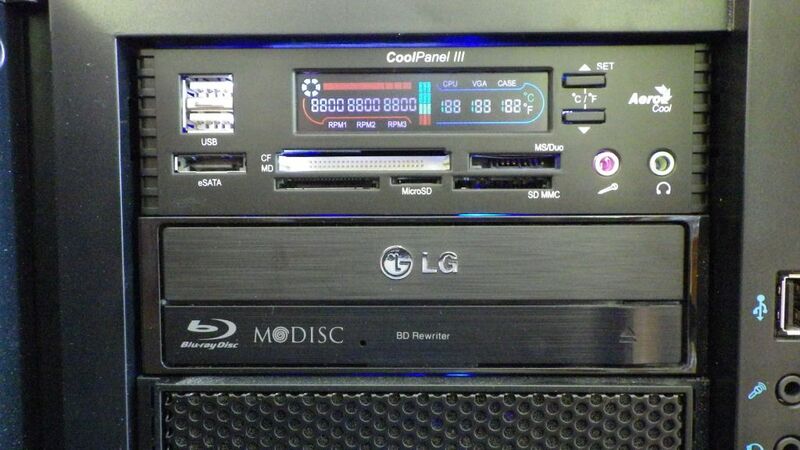 The coolpanel 3 has a media card reader, 3 channel fan controller/ temperature display, audio ports, USB ports and ESATA port. At this point I’m using the USB media card reader and temperature display. The rest of the functions don’t make sense in my current system. There are no more USB connectors on the MB and there are USB ports on the top and front of the case. The temp display is way cool tho and I really needed that media card reader.